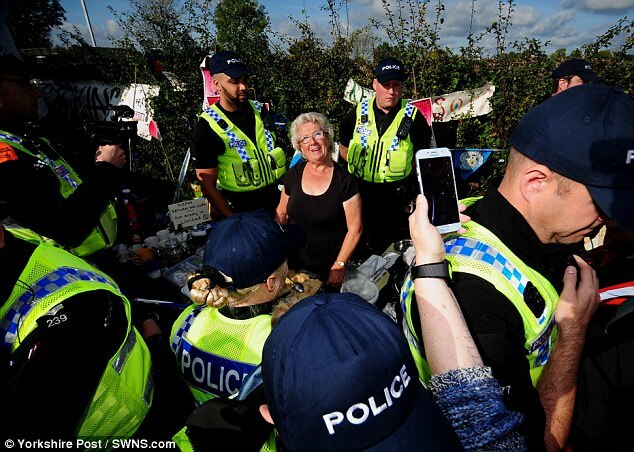 A great-grandmother was forcibly moved from her tea table by police at a fracking site yesterday as a long-running protest by environmental groups intensified. 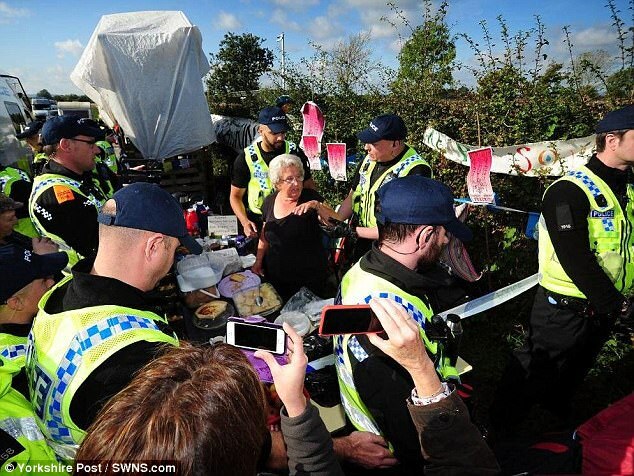 Former nurse Jackie Brooks, 79, has been serving tea and cake over the past month to protesters and police in Kirby Misperton, North Yorkshire, with her husband Jim. 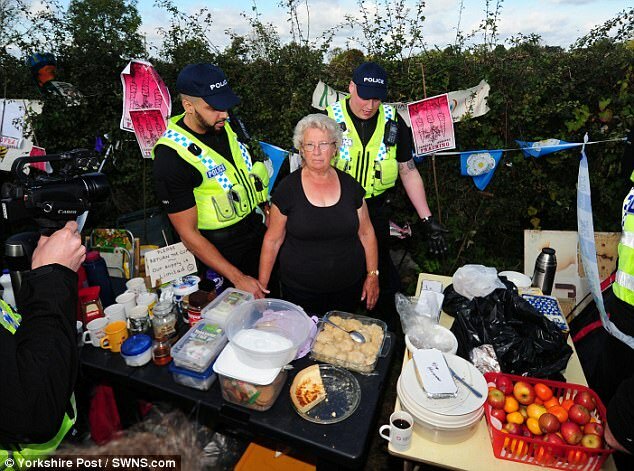 But North Yorkshire Police told the tea lady she had to be moved over fears that she might be injured if a nearby 10ft-high tower made of wooden pallets collapsed. It came after a protester called 'Eddie' had been sitting on the tower for nearly a day, and the council arrived to assess its safety - before deciding it should be removed. After people had been cleared, the 33-year-old man was removed and arrested on suspicion of causing a danger to road users and obstructing a police officer. Mrs Brooks told Minster FM: 'I thought it was petty bullying, telling us that we could be crushed by that tower when we know darn well it's as strong as it can be. 'Eddie wouldn't be up there if he thought that it was going to fall down. So it's just another way of pushing us around - it's bullying tactics. She also wrote on Facebook: 'They wanted me out of the way so they could try to bring Eddie down from his pallet tower, said they were worried about my safety if the tower fell. 'No way, Eddie and his friends know how to build a solid structure, he had spent the night there. After they moved my tables, they finally allowed a tent to be moved so I was able to set up again a few feet further along. 'Then they sent for a police mountain rescue team from South Yorkshire, they built a scaffolding tower next to Eddie's pallet tower, took them ages. North Yorkshire Police have previously faced accusations of mounting a 'disproportionate' and expensive show of strength at the site. 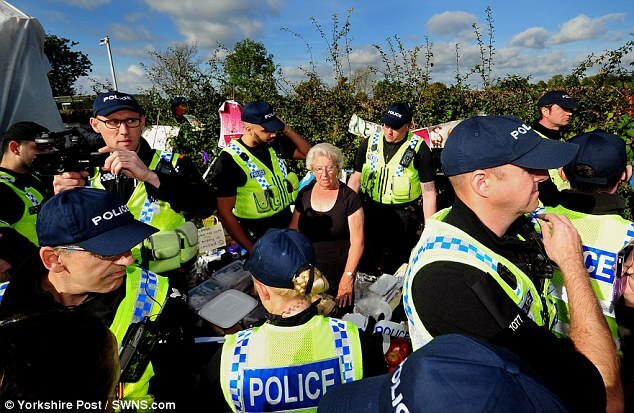 Up to 50 police officers at a time are dealing with the protest that has been prompted by the start of work to prepare for fracking at the Third Energy well. Protester ‎Marion Collins‎ said on Facebook: 'I popped up to Kirkby Misperton this morning to stand in solidarity for a couple of hours with all the lovely people up there. 'I was having a chat and just about to get a cuppa from the wonderful Jackie (who) has been serving tea and homemade cake to the protesters and police alike for the last month. 'All of a sudden a lot of police approached us demanding me and Jackie - and her table - immediately move further away from the 'dangerous structure' that was too far away to hit us, even if it had spontaneously fallen over in our direction. 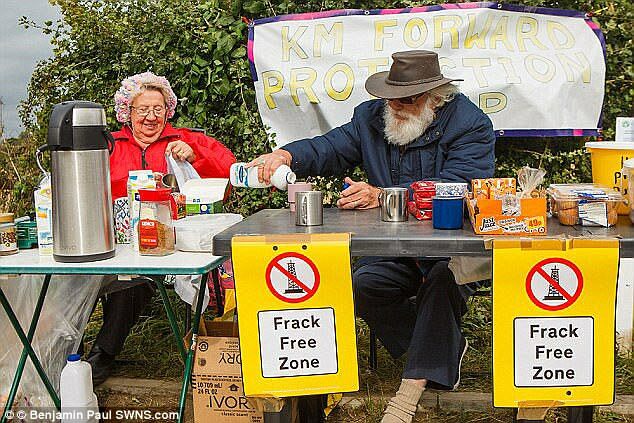 Many of the protesters are pensioners who fear the controversial method of mining for gas and oil poses a threat to the beautiful and unspoilt rural area. It involves injecting water, sand and chemicals at high pressure into rocks deep underground to open up fractures in the rock and release trapped supplies. 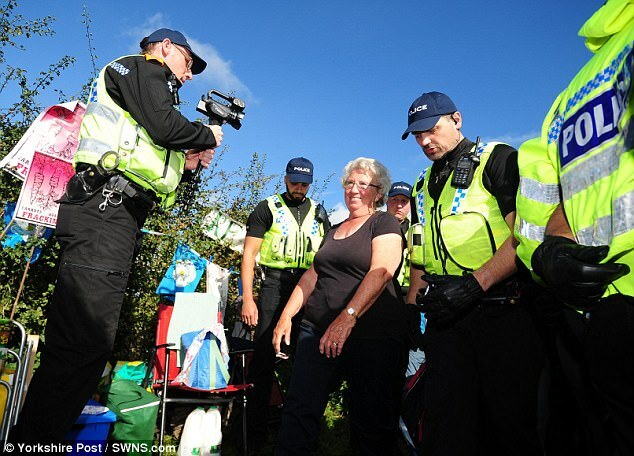 Superintendent Lindsey Robson, of North Yorkshire Police, said: 'We have a duty to ensure the safety of everyone involved in protests at Kirby Misperton. 'Officers had to move several people away from a tower of pallets this morning, after we received advice from the local authority that it may not be safe. Separately yesterday, police said they enabled a 20-minute peaceful protest to take place at the site with a convoy of lorries allowed to leave with no issues. About 20 demonstrators were said to have sat and stood in the road in front of the entrance to the site, as four heavy goods vehicle waited to leave. 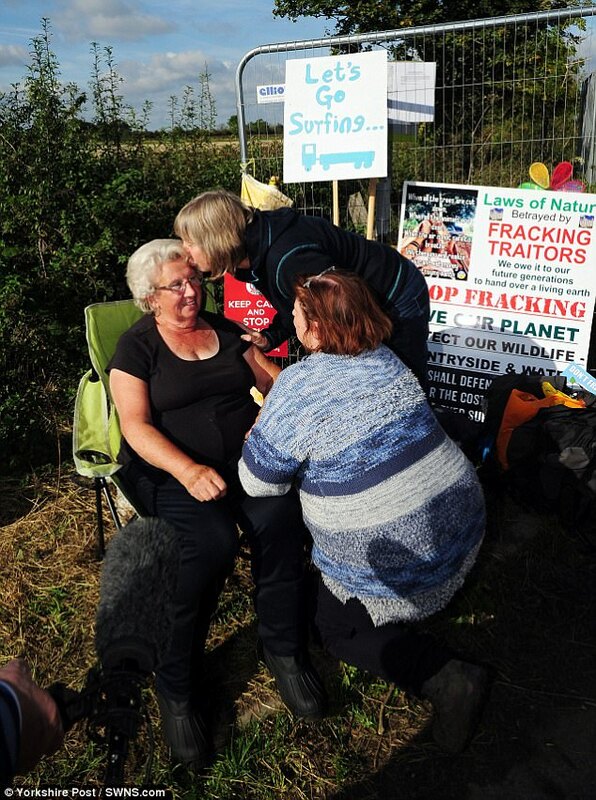 Third England was granted permission to frack on the site last year, and the protests there began about a week before it started moving in equipment on September 19. The company has not yet received final Government consent to begin fracking, but hopes to start doing so on the site before the end of the year. Also yesterday, Tory former Cabinet minister Lord Tebbit claimed opposition to fracking is 'nimbyism and it needs to be put down'. He warned if the authorities 'were to give in' to protesters opposed to the technique, then those campaigning against new housing developments 'would be at it as well'. The Conservative peer made his criticism during a question in the House of Lords on the additional policing costs generated by fracking.